Protect your hotel, student residency or other high-turnover accommodation against theft: Chubbsafes' hotel safes are ideal for storing your customers' cash, valuables, passports and other sensitive documents. Customers and residents at hotels, dormitories and other high-turnover accommodations increasingly expect to have access to convenient, private and secure storage facilities in which their valuables, passports and other important documents can be protected from theft or loss. 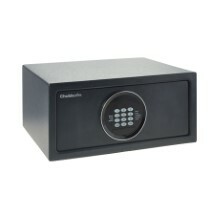 The Chubbsafes' hotel safes combine burglary protection with unrivalled simplicity and reliability. Optional add-ons enable you to customise the model to your specific needs.